Immigration: Which side are you on? Thirty years ago in May, my family and I came to Canada in search of a better life. We were lucky as immigrants. Back then, we were embraced by our adopted country. My family didn't have to face physical hardship to migrate – there were no clandestine meetings nor did money change hands. Most important, we did not face the spectre of a massive barricade to our entry into a better life. In the end, they all have the same message: Keep Out. But today, things are changing. Walls, both figurative and literal, are going up throughout the world. While they are meant to impede illegal immigration, they send a message to all outsiders. On May 26, the U.S. Senate approved an immigration reform bill that added an extra 600 kilometres of double and triple-layered fencing along the U.S.-Mexico border. For the Minutemen of Arizona, this wasn't enough. The volunteer corps of border patrol “guards” announced the next day they would begin building a fence in Palominas, Ariz., to supplement what the Senate approved. The Minutemen have recruited 1,000 volunteers to build the fence and raised $225,000 US in donations for their cause. When completed, the 16 kilometres of barbed wire, razor wire and steel rail barriers, will stand as a symbol of anti-immigrant fervour in the U.S. 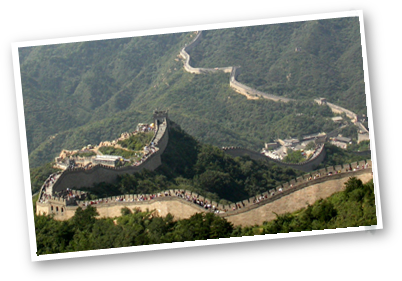 The most notable barrier in the world is the 6,400-kilometre Great Wall of China built more than 2,000 years ago to keep invading hordes out. The wall keeps cropping up in history, a malevolent concept to be recycled whenever people feel threatened. Recent examples include a 500-kilometre electrical fence between Botswana and Zimbabwe, which aims to prevent Zimbabweans from illegally entering Botswana, and India's continuing construction of a steel barricade – to span 4,000 kilometres when it's finished in about 10 years – to stem the migration of Bangladeshis. Is there no end to this, even today? I acknowledge that the top industrialized countries cannot welcome the world's poor, but they do have a responsibility to share their wealth and knowledge. Wall-building is not a solution. The failure of fortifications to thwart illegal migrants is evident in the example of Spain's territories of Ceuta and Melilla in North Africa. Fences surrounding the territories were doubled in height to stop the flow of Moroccans from entering. High-tech equipment was installed to make the walls watertight. What did the desperate migrants do instead? They opted to embark on dangerous 10-day journeys on flimsy rafts to the Canary Islands (another Spanish territory), 115 kilometres off Morocco's southwest coast. According to the Center for Comparative Immigration Studies at the University of California, 8,000 migrants have been caught on their way to the Canary Islands this year, nearly double the total in 2005. There are no simple solutions to the world's migration problems but efforts need to be made to make conditions better in other countries by raising the standard of living. An example could be made using Spain again. The European Union kept its borders tight for five years after Spain became an EU member in 1986. At the time, the wealthier countries were afraid that waves of Spaniards would overcome them as a result of the lower standard of living in Spain. During those years, the richer countries provided a steady stream of aid for infrastructure and training, and made sure the country developed a decent social safety net. As a result, Spaniards working in the richer European countries decided to return to their homeland because of increased opportunities. Another solution would involve forgiving the debt of impoverished nations so they can concentrate on improving the lives of the people in their countries. Mexico's debt, for example, stands at $140 billion US, one of the biggest in the world. True solutions require thought and would have long-term results. Physical walls are merely manifestations of real or imagined fears about "The Other." It disturbs me that we are unable to escape this type of thinking. Differences between people are often magnified by politicians looking to accomplish their own agendas. Building a wall is a ploy: it simply diverts attention away from having to come up with a workable solution. Citizens of wealthy countries need to recognize a few truths, namely that patterns keep repeating: older immigrants who have become established in their new country are keen to shut the door on newer immigrants. North America has been labelled frequently as a land of immigrants, and yet it is actively building barriers to immigration. What's surprising is that people so conveniently forget that the history of the world is about migration. No one actually belongs to a piece of land: whatever culture you have, you carry with you – in other words, it's internal, not embodied by a piece of rock. I go back to the Great Wall of China. Historians believe it originated as a military fortification against incursions by tribes on the borders. When I see walls going up these days, it's obvious to me that we have not escaped our basest instincts from thousands of years ago. Despite advancements, often when it comes to our grand-scale relationships with each other, we are judged by the colour of our skin, the language we speak, the religion we follow. That means we are still people appended to tribes, protecting lands and preventing the hordes from entering. As a society of migrants and wall-builders, we are no better than our ancestors from 2,000 years ago. Do you know which side of the wall you come from? Trace your family roots and chances are you'll find the answer is both.